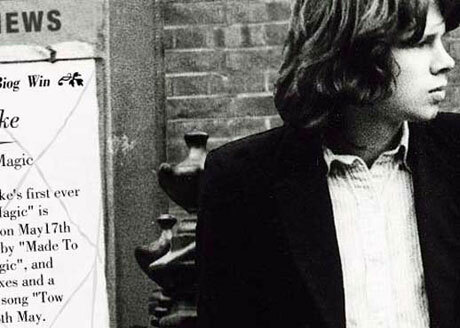 In step with a seemingly never-ending fascination with the late, great Nick Drake, reports have surfaced that the influential Anglo folkie will get a tribute disc sometime later this year. In an interview with Billboard, the company that owns the rights to Drake's catalogue, U.S. publisher EverGreen Copyrights, said it has inked a deal with Jack Johnson's Brushfire imprint to release the album, which, for better or worse, will include artists such as Dave Grohl, Eddie Vedder, Norah Jones and Johnson taking on Drake's tunes. Also, the disc will reportedly feature the late Heath Ledger, who had a very public fascination with the British songwriter. EverGreen Copyrights' co-founder and CEO David Schulhof said Ledger's contribution would be included on the tribute album's accompanying DVD and come by way of the star's yet-unreleased film version of the Drake song "Black Eyed Dog," which Ledger made in 2007. And if you're by now feeling a bit squeamish about all this looking a bit like a cash-in, Schulhof assured Billboard it is: "Fans are willing to pay for that kind of product. No one in the world has ever seen that [Ledger video] before." Since Nick Drake died in 1974 of a suspected drug overdose, he has yet to comment. Nick Drake "Black Eyed Dog"